Music In Action’s outstanding ‘Concert for the Coastline’ with the Jersey Chamber Orchestra took place on Saturday 2nd October, and as part of the event the wonderful Rococo String Quartet were brought over to the island for a residency at the academy. 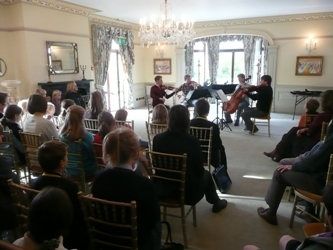 During their stay here, the quartet performed an after-school concert which was very well attended by young musicians and their families. The quartet performed Frank Bridge’s Three Idylls for String Quartet, which was a performance marked by some truly impressive and almost ‘orchestral’ textures. This was followed by Mozart’s lively Divertimento in D, in which the group shared some moments of great fun and levity. An interesting Q and A session followed, giving everyone a chance to find out more about the quartet and the music they had performed. Following this, the quartet were joined by some of the academy’s higher level string students to rehearse and play together Mozart’s Divertimento in D. The opportunity to play in the heart of a professional quartet such as this was a wonderful experience for all involved. We would like to thank the Rococo String Quartet and Music In Action for this residency, which we hope to repeat in the future.